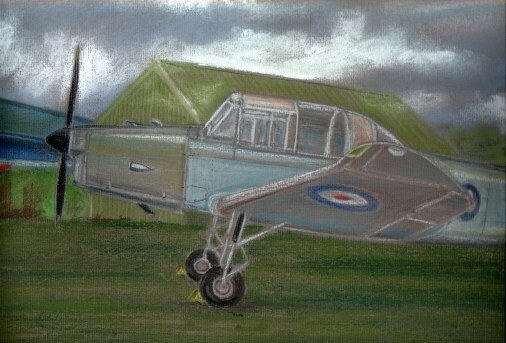 Percival Prentice T.1 VS610 at the Midland Air Museum,Baginton,artwork by Barry Clay on location. 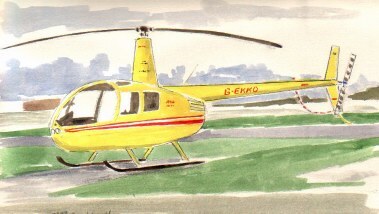 Brantly B.2B Painted on location at Wellesbourne on 27-08-2002,the classic lines of this vintage helicopter are shown to advantage in this picture of G-ASXD. 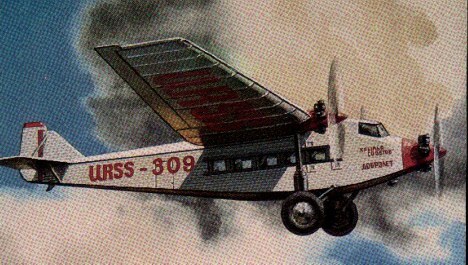 The Three engined Antonov ANT-29 paved the way for Russian air Transport,built much along the lines of the American Ford Trimotor prior to the appearance of the venerable Dakota aircraft. 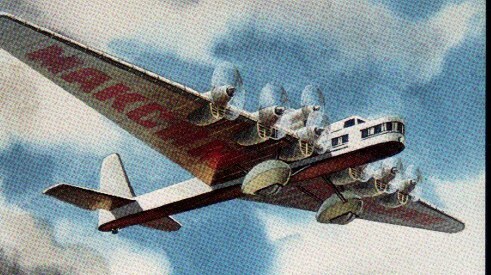 Maxim Gorky russian 7-engined aircraft,note the additonal engine mounted on top of the fuselage, they dont build them like this anymore! 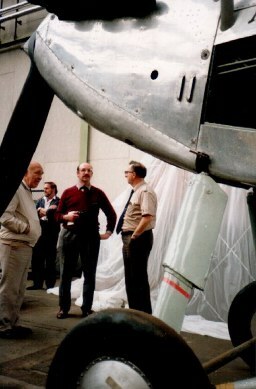 Barry (pictured centre) studying detail on the RAF Museums Hawker Hart biplane at the storage facility at Cardington on 19.10.90 for a future painting of the subject,to the right is the then curator Ray Funnell who ran the Handley Page Association,Barry was responsible for saving this aircraft from Carlisle many years earlier and bringing it to the attention of the RAF Museum. 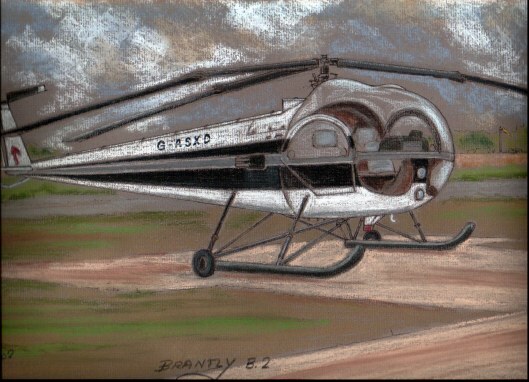 GALLERY 1-THE AVIATION ARTWORK OF BARRY CLAY AND THE PHOTOGRAPH COLLECTION. 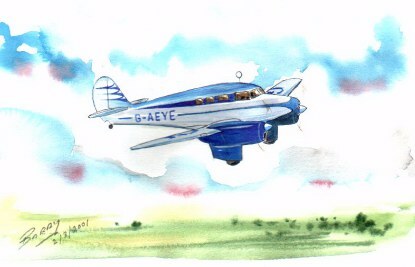 The Ace was designed with a revolutionary control system which incorporated the rudder into the control spectacle,by twisting the top of the spectacle this operated the rudder,however after a demonstration to flying instructors throughout the UK the system did not go down well and Chrislea redesigned the aircraft with conventional controls and a tail dragger undercarriage to become the Skyjeep,very few of this interesting aircraft were built and when the original designer R.C.Christophorides left the company the company struggled on until the assets were sold off to C.E.Harper Aircraft Ltd who scrapped off the remaining nine incomplete airframes. 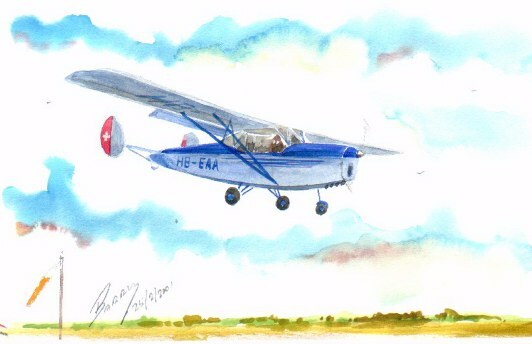 This famous touring aircraft was the result of a request for a cabin enclosed touring aircraft to be built by this famous British company,these aircraft made many famous flights together with the similar Puss Moth with its different wing planform,a few examples remain of this gentlemans aerial carriage and the one shown in this painting was operated by Alvis Ltd from Baginton in the seventies for communications duties. 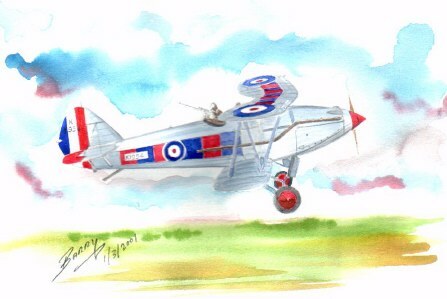 The Hart was the standard day bomber of the Royal Air Force in 1936,designed in 1929 and powered by a 500 hp Rolls Royce Kestrel Aero engine,which gave it a top speed of 184 mph with a full service load,several versions of the Hart entered service,when equipped as a two seat fighter it was called the Demon,and when used for Army co operation duties it became the Audax. The Fleet Air Arm versions which were usually fitted with floats became the Osprey. 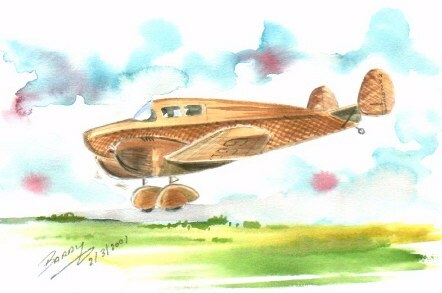 This aircraft was designed and built as a plastic mouldings demonstrator in the USA in 1940,the two aircraft produced had the wing built in 5 integrally moulded units,the fuselage in 3 pieces and the engine cowlings/firewall were made from a ply and asbestos sandwich.The surfaces were then highly polished to reveal the beautiful veneer finish of the aircraft,it was almost like a piece of flying furniture,one wonders what happened to such an aircraft? one of the prototypes was registered NX29339. 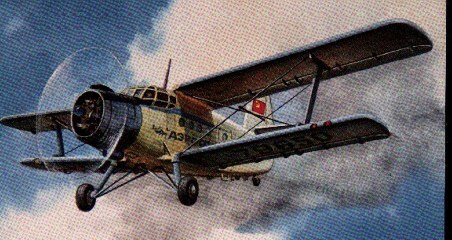 Built in 1937 as a UK which used a stressed skin all wood construction which gave a smooth aerodynamic finish and the convenience of small scale production.The structure consisted of a two spar torsion box wing,spruce girder ribs with diagonal bracing struts,thus eliminating wire bracing,a ply box streamlined fuselage with stringers and fabric added,this contributed to the fact that this aircraft was the fastest aircraft in its class pre war. 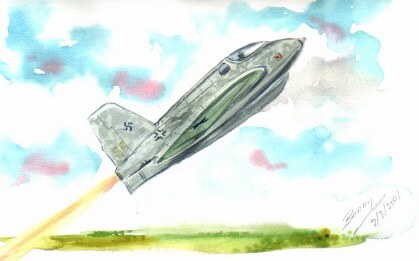 This was the most famous of the 'Target Defence' fighters,conceived by Alexander Lippisch for DFS in 1941,the Komet was in service by August 1944,the construction was a wooden wing with 8 mm laminated skin,a box section spar,duralumin fuselage shell which was built in two halves,two 30 mm cannons were fitted in the wing roots and the undercarriage was jettisoned on take off,the aircraft then landed on a skid which retracted into the fuselage.Nearly 400 were built but more were lost in accidents than in combat due to the highly dangerous and volatile catalysts C-Stoff and T-Stoff which was used for its propulsion.For a detailed account of Komet operations and testing I can reccommend reading the book 'Rocket Fighter' by Anna Reich. 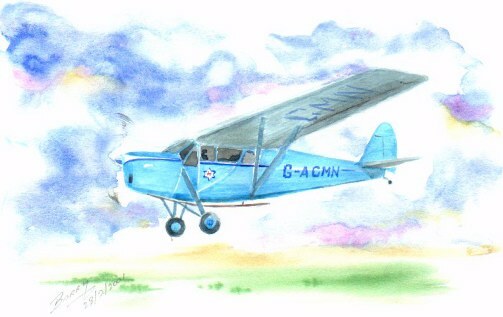 The De Havilland Canada Beaver illustrated was probably G-ANAR imported from Canada as CF-GQE by the parent British company at Hatfield,the aircraft was then serialled XH463 for evaluation by the Army Air Corps in September 1954,eventually re-serialled as XN142 in 1958 and then re-engined with an Alvis Leonides radial engine and evaluated at Baginton by Alvis Ltd,after a spell of intense test flying the aircraft was sent back to Canada as CF-CNR and this workhorse may still be flying. This company publicity photograph shows one of four prototype Canberra B.1 aircraft produced to Air Ministry specification B3/45 and fitted with Rolls Royce Avon engines,note the large letter 'P' in a yellow circle a pecularity of prototype aircraft produced in the later stages of the Second World war and during the fifties but a practise that is now discontinued. 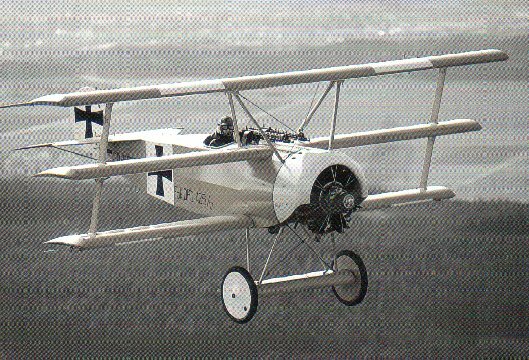 Over the years many replicas of the famous Fokker DR.1 Triplane have been built,some good ones and some bad ones,this one was built in Germany by a specialist replica builder and is powered with a Warner Scarab radial engine which fits neatly inside the cowl,originaly owned by Tomy Beier who provided the photograph.